Our Civitavecchia – Palermo ships will take you to Sicily quickly and with a pleasant trip thanks to the numerous on-board services, some of which thought for your pets. Moreover, you can admire marvellous panoramas and the Tyrrhenian coast from our decks during navigation. And for a more comfortable journey, you can stay in cabins equipped with any comfort! In order to reserve your space on our ships, just use our simple and user-friendly online booking tool: you can purchase your tickets in a few steps. 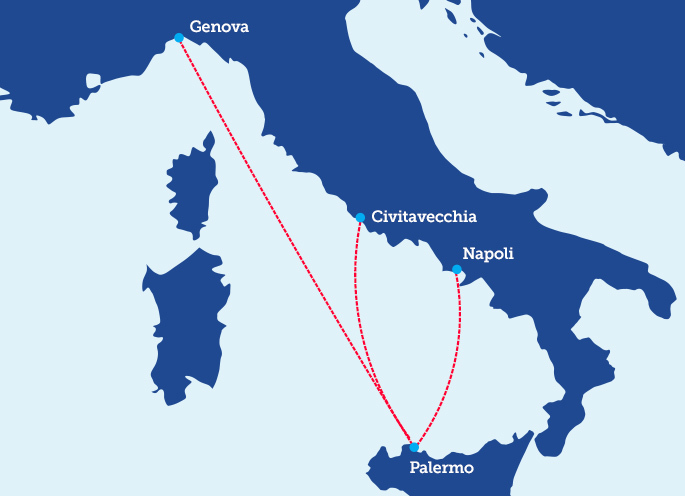 Depart on-board GNV and SNAV Civitavecchia – Palermo cruise ferries and discover a new way to enjoy your trips.